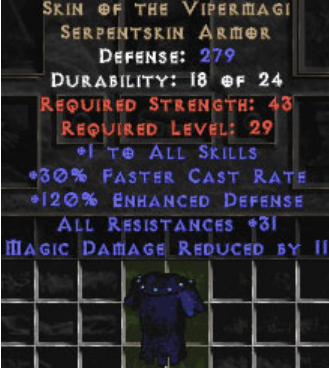 Many classic lightning skill master sorceresses choose Vipermagi as preferred body armor. The advantage of Vipermagi is 30% FCR, +35 total resistance. With tow Jordan rings it's still easy to reach the 117% FCR breakpoint (chain lightning 12F, teleport 8F). Due to the high resistance, the all resistance charms in the inventory can be replaced with skillers, thus ended up with 2 higher lightning skill levels. In general, it is easy to reach 2 more skills, chain lightning 12F, and 1000 defense, as a more balanced sorceress build.